Panorama Village is an active adult neighborhood located in Hemet, California. This 501-home community provides a vibrant social atmosphere within an intimate and tranquil setting. A clubhouse with a rich lineup of amenities, including a nine-hole executive golf course, keeps residents physically active and socially engaged any day of the week. Ideally situated within the Inland Empire area, residents live in a prime location that's close to daily conveniences and major roadways. Homeowners also enjoy breathtaking mountain vistas as well as easy access to Southern California's recreational and cultural activities. The central hub of activity and recreation is found at the clubhouse. Residents have plenty of areas for socialization like a multi-purpose room, lounge, and auditorium. They can stay in shape by visiting the exercise room or relax in the indoor spa. A computer lab and library are perfect for catching up on emails or reading the latest novel. Neighbors can bond by hanging out in the hobby and game room or playing cards and billiards. A catering kitchen comes in handy when preparing a snack for a community event. The well-appointed amenities continue outdoors with a swimming pool, spa, and patio. Residents can challenge each other to a friendly game on one of the shuffleboard courts or at the nine-hole executive golf course. A putting green is available on-site for homeowners who want to practice their golf skills. The community has an R.V. parking facility where residents can store their vehicles when not in use. Active adults can take their health routine one step further by jogging along the neighborhood's walking and biking trails. Residents also love having all of the parks and natural space as well as scenic ponds that add a beautiful backdrop to this active adult community. Panorama Village was built between 1962 and 1968 by developers Walter and Calland. This 55+ community consists of 501 single-family homes that are available on a resale-only basis. Active adult homebuyers can choose from a variety of affordable homes that range in size from approximately 912 to 2,371 square feet. They have two or three bedrooms, two or three bathrooms, and an attached one or two-car garage. Single-family homes typically feature open layouts, large kitchens with plenty of cabinet space, hardwood laminate floors, covered front porches, and beautiful backyards. A monthly homeowners' (HOA) fee covers common ground maintenance and access to all amenities. Since the HOA takes care of exterior home maintenance, residents have more time to pursue new hobbies and other interests. This vibrant and welcoming neighborhood offers events, classes, activities, and clubs that allow members of the community to get involved with each other and build lifelong friendships. Residents stay active by playing golf, Wii bowling, shuffleboard, or joining an exercise group. Neighbors can also socialize over a game of billiards, cards, or bingo at the clubhouse. Panorama Village hosts fun events and interest groups like R.V. club, ladies or men's scramble, breakfast club, dancing, karaoke, BBQs, and holiday parties. The options for social recreation are endless in this age-restricted development. 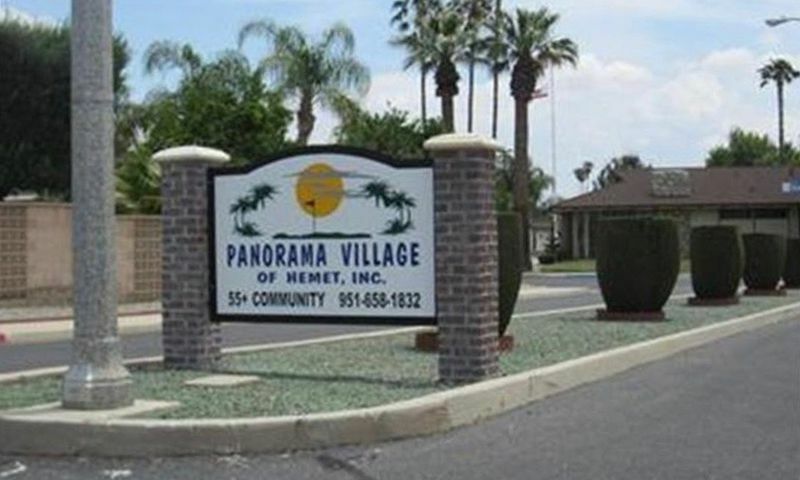 Panorama Village is located in Hemet, CA, which provides a small-town charm as well as all of the daily necessities homeowners could want or need. There are a variety of retail shops, restaurants, banks, gas stations, and pharmacies as well as Hemet Valley Mall just a few minutes away. Ramona Bowl Amphitheater is a ten-minute drive away where residents can catch a live outdoor play. There are several parks nearby, including Diamond Valley Lake, which offers outdoor recreational opportunities like boating and fishing. The Seven Hills Golf Course is less than ten minutes away for a quick game before heading home. Healthcare facilities can be found at Hemet Valley Medical Center that's eight minutes away. This 55+ community is about two hours from Los Angeles and an hour-and-a-half from San Diego. Residents can plan day trips to these big-city destinations to explore all of their cultural attractions and entertainment options. When traveling long distance is required, homeowners can board flights out of Los Angeles International Airport or San Diego International Airport. Panorama Village is the perfect retirement destination for active adult homebuyers in Southern California. There are plenty of activities available in Panorama Village. Here is a sample of some of the clubs, activities and classes offered here. Panorama Village was built between 1962 and 1968 by developers Walter and Donald Calland. This 55+ community consists of 501 single-family homes that are available on a resale-only basis. Active adult homebuyers can choose from a variety of homes that range in size from approximately 912 to 2,371 square feet. They have two or three bedrooms, two or three bathrooms, and an attached one or two-car garage. Single-family homes typically feature open layouts, large kitchens with plenty of cabinet space, hardwood laminate floors, covered front porches, and beautiful backyards. Please Note: Floor plans are not available at this time. The main page states "Since the HOA takes care of exterior home maintenance...". Let me just say that it does NOT. The HOA is only for the use and maintenance of the golf course, pool and club house buildings. As far as any exterior home maintenance, you're on your own. Most yards are old, green painted cement, or rocks. When we bought our house here 6 years ago, we were told that the HOA had remained at $60 for many years. They've since raised it multiple times, and it is currently $90 a month. Not bad, as far as HOA's go, I suppose, but we don't like being misled, and we never use any of the facilities. TV was supposed to be included in the HOA as well, but it's only local channels, which started going out, one by one, within the first year we lived here. The person in charge of that was extremely rude, so we have had to pay for an outside company instead. So much for getting anything for the HOA fee. It's a nice enough here. The quietest place we've ever lived, which we enjoy. Backyards are miniscule. Heat is a problem. Summers are brutal, and rain usually bypasses Hemet altogether. 55places.com is not affiliated with the developer(s) or homeowners association of Panorama Village. The information you submit is distributed to a 55places.com Partner Agent, who is a licensed real estate agent. The information regarding Panorama Village has not been verified or approved by the developer or homeowners association. Please verify all information prior to purchasing. 55places.com is not responsible for any errors regarding the information displayed on this website.